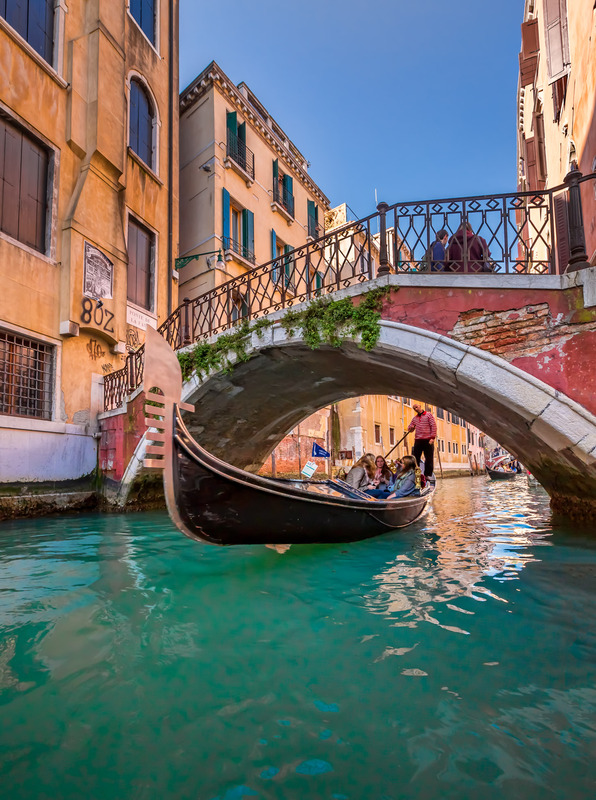 Gondola ride is one of the most iconic experiences in Venice. I wondered often if people actually use the gondola as a means to commute to work, the store, etc. March 2014, single image, focal length 16mm, aperture f/8, shutter speed 1/80 second, ISO 640, handheld. It turns out these are mainly used as a tourist experience. Few gondolas even operate as taxis! The gondola just takes you around for a certain amount of time, usually about 40 minutes, before letting you out. This impracticality would never stop a tourist from hopping onto one of the most sought after experiences in Venice. Like any tourist caught up in the beauty of Venice including the gondolas, I could not put my camera away. Usually when travelling I save shoots for the morning and evening when the light is beast. And during the day I research the best places for photographs and it really takes this level of investigation to capture the emotion and composition for high quality photos. Moving on, my son and wife accompanied me on my morning shoot, but by this time of day headed back to the hotel for breakfast. My instinct to stay out and capture the beauty of Venice was right. This photo is an example where I caught an intimate photo of tourists enjoying a gondola ride on a small, charming canal.